Fantastic news! According to Pathe, we’ll be able to get a first look at the highly anticipated “The Iron Lady” teaser trailer when it goes live exclusively on The Guardian website and on BBC Breakfast after 8:30am on July 7. Be sure to find it on Simply Streep as well, after its broadcast. Edit: The teaser – which is running for roughly a minute – can be now watched in the video archive. Here’s another fantastic treasure from the past. In December 1981, Meryl Streep, Donald Sutherland and Richard Chamberlain honored actress Helen Hayes at the Kennedy Center Honors. The appearance can be now watched in the video archive with captures being added to the image libary. Enjoy! Here comes a very rare and fantastic new find courtety the exceptional Bobbie Wygant Archives. In late 1982, she interviewed Meryl for the theatrical release of “Sophie’s Choice”. The full eight minutes interview video can be watched in the video archive – captures can be found in the Image Library. Enjoy and be sure to pay Miss Wygant’s website a visit. Many thanks to Simona for providing these two fantastic interviews for the video archive. In 2009, while Meryl Streep was visiting the Rome International Film Festival to promote “Julie & Julia”, two interview specials were produced by the festival for Italian television – Incontro and Viaggio Nel Cinema Americano – both very insightful and funny. The two specials can be now watched in great quality in the video archive. Thanks Simona! Enjoy watching. Here is another rare find for the archives. In 1996, CBS aired a Siskel and Ebert special, featuring interviews with some of the greatest filmmakers of their time, inluding Meryl Streep. She and Gene Siskel first visited Yale for a discussion with students, and then sat down at Frank Pepe’s Pizzeria (seriously) for an interview about Meryl’s time at Yale and her successful film career. This interview is insightful and at times downright hilarious, which makes it a must-see. Enjoy! Additionally, screencaptures have been added as well. Many thanks to Peter for sending in the teaser trailer for the recent documentary “Where the Work Is: The Austin Pendleton Project”. It can be watched on Youtube and Simply Streep’s video archive. “The Austin Pendelton Project” is the profile of an artist that has been up and down for more than four decades and always gone where the work is. Artists and film directors Gene Gallerano and David Holmes attempt to capture and explore the process that a teacher and director uses to help actors understand the reality of a given circumstance in imagined situations and the intricate navigation of arriving at a point of truth. With support and insight from an incredible pool of actors, writers and directors including Olympia Dukakis, Meryl Streep, Louis Zorich, Laurie Metcalf and more, the discovery of Austin Pendleton’s struggles and successes will be illuminated and explored. More on the documentary can be found at its official website. Here’s another great find for the archives! In 1978, Meryl won a Primetime Emmy Award as Outstanding Lead Actress in a Limited Series for her breakthrough performance in NBC’s “Holocaust”, her very first major award after transferring from the New York stages to film and television. 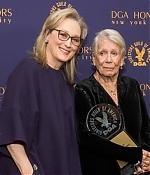 Meryl didn’t attend the awards ceremony to accept the award since she was filming in New York.